When Europeans first settled in Australia, the land withheld many of its secrets from these new arrivals. There were broad rivers, wide plains and tall forests, all of which, to European eyes, suggested promising sites for settlement. To many of the new settlers, the First Australians were a puzzle. They moved freely through country they knew intimately. They had useful things to say to the European newcomers if they would listen. What few realised then was that Aboriginal people and the land they lived in were indistinguishable. Failure to read the people made it hard to read the country. Invisible Country describes the environmental change that has occurred in south-western Australia since European settlement, through four case studies of the development of local rivers, forests and coastal plains. 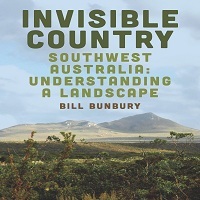 These stories, compiled through extensive conversations broadcaster and writer Bill Bunbury has conducted with farmers, ecologists, traditional owners and others who rely on the land, are book-ended by an examination of the historical perspective in which these changes have occurred. It is a reminder that the land owns people, not the other way around, and is the beginning of a conversation about understanding and care for a land we are all lucky to live in.